The Windows version of Google Chrome 4 is out of beta and you can finally try the features that were previously available in Chrome's beta and dev channels. Google will automatically update the browser to the latest version (4.0.249.78), but you can also click on the wrench button, select "About" and manually update the browser. The most important feature released in Google Chrome 4 is the support for extensions. Chrome extensions are easier to create than Firefox extensions because they're nothing more than web pages that use Chrome's APIs. That's why you can install or disable extensions without having to restart the browser, that's why extensions use separate processes and this is one of the reasons why Chrome extensions are more limited and don't have a consistent interface. Google Chrome has built-in support for user scripts, so you don't need to install an extension like Greasemonkey. 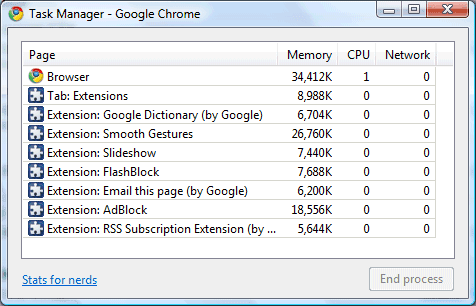 Chrome can convert user scripts into extensions, so many Chrome extensions are just glorified Greasemonkey scripts. 1. RSS Subscription Extension. Detecting and previewing feeds is a standard feature in most browser, but not in Google Chrome. This extension shows an orange icon in the Omnibox when it detects feeds and lets you subscribe to one of the feeds using your favorite feed reader. You can select one of the popular feed reader that are available by default (Google Reader, iGoogle, Bloglines and My Yahoo) or you can add another feed reader. 2. Email this page. Firefox's contextual menu has an option called "send link" that lets you send a link to the current page using your favorite mail client. This extension has a similar functionality, but it only lets you pick the default mail client and Gmail. 3. Google Dictionary shows the definition of a word when you double-click on it. It only support monolingual dictionaries and a small number of languages, but it's useful if you want to find the definition of a word without opening a new page. 4. Docs PDF/PowerPoint Viewer - a simple extension that detects the links to PDF, PPT and TIFF files and opens the files in Google Docs, so you can view them without installing additional software. 5. Slideshow - a great way to view the images from sites like Flickr, Picasa Web Albums, Facebook, and Google Images in a slideshow. 6. Empty New Tab Page - a simple extension that replaces Chrome's new tab page with a blank page. 7. FlashBlock disables Flash content for all web pages and replaces it with a placeholder. Click on the placeholder and you'll enable the Flash element. This way, you'll no longer see Flash ads, annoying Flash animations and other unnecessary objects that slow down your browser. 8. AdBlock hides ads using frequently-updated filter lists. You can whitelist domains and subdomains using Ctrl+Shift+L. 9. Secure Login Helper redirects you to the HTTPS login pages for sites like Twitter, Facebook and Twitter. 10. Smooth gestures - use mouse gesture to perform actions like going back one page, going to the top of a page or opening the last close tab. Mouse gestures are intuitive and you can customize them. If you found other great Chrome extensions, mention them in a comment. For sending page links - I'm using SendLink (http://goo.gl/OUxY), works just fine. May be I'll switch to "Email this page" if it's better. Thanks for "Secure Login Helper" tip - wasn't aware of that one. One Number is great. You can check new mails, feeds, voices and waves at once with it. Is there a drop down menu anywhere for extensions/ I can only see half of my enabled extensions, meaning that only half the icons are visible on the tool bar;thus I cannot use the 'hidden' extensions. I use chromeplus which has features 8 and 10 embedded. 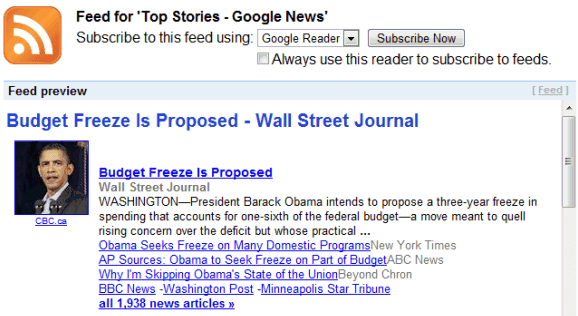 TPGoogleReader (http://goo.gl/5O3Q) is a truly awesome extension for Google Reader users. P.S. "Twitter, Facebook and Twitter." !!! Chromed bird - twitter client...must have! "StayFocusd is a productivity extension for Google Chrome that helps you stay focused on work by restricting the amount of time you can spend browsing time-wasting websites. Once your alloted time for the day has been used up, the sites you have blocked will be inaccessible for the rest of the day." Here are my current Extensions. Bubble Translate extension By v1c1ous (bubble.translate@gmail.com). Save bookmark to Diigo & cross post to Delicious with 1-click. Diigo also captures a page snapshot. Support Twitter/Facebook login. Inspect JSON in your browser, pretty-printed and color coded. LastPass is a free password manager and form filler. LastPass is also available for Firefox, Internet Explorer and Safari (Mac). More of my favorites are listed here. 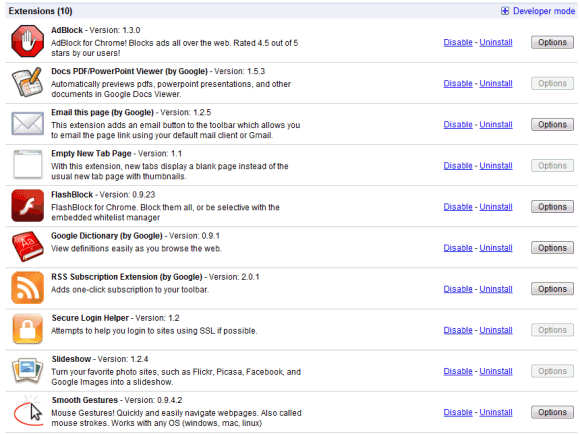 Looks good if the add-ons are as many as add-ons in Firefox. Oh don't forget Alexa Rank and Google Rank in the proper user interface. I think Adthwart is considerably superior to Adblock. BoogleMarks. As a long-time Google Toolbar user, I used the Google Bookmarks feature for ages. 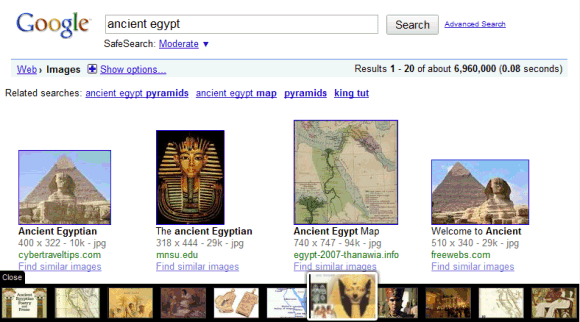 Well, BoogleMarks is the best of the extensions that lets you continue to use Google Bookmarks. It's got some nice features, and is a lot more useable than the others out there. It also seems to be regularly updated, which is nice. Google bookmarks by jimmy.liang is a nice one. Google Have really dont a great thing to introduce Extensions for chrome like firefox addons. Now peolple have choice to choose the best browser with lite weighted. It includes some basic information, and what I did and did not like about the extensions. IF, "they're nothing more than web pages that use Chrome's APIs." Then explain why they don't work in Chrome 4 on the Mac! You should also checkout the flash plus extension. It is at http://bit.ly/flashplus. The extensions lets you resize and move flash on web pages, view videos and play games on full window. "Extension for enhancing the awesome photo sharing site, Flickr. Adds keyboard shortcuts, tag autocomplete, a lightbox for large previews, quick access to EXIF data, easily copy Flic.kr short URL to the clipboard, and a page action that allows you to easily get from a Flickr image URL back to it's photo page." Nice list. But i think you forgot, stumbleupon and google mail checker. i have found Quick Google useful, since it allows me to manage and login to multiple google accounts easily. I have been reluctant to use Google Chrome as my primary browser but having come across this post and all the suggestions on the comments, I could probably be tempted - although maybe I should save some time and resist!! I think "Adblock" is most popular extension..it has already 1,208,268 users..
Tab Extract is a really great new extension using the omnibox. yes, "Adblock" is a great extension, now "Adblock Plus" is also available for Google Chrome and can be downloaded from "https://chrome.google.com/extensions/detail/cfhdojbkjhnklbpkdaibdccddilifddb"
Awesome collection. Thanks for share. All the rest are tab managers. Originally I installed them all to figure out which one was the best, but as it turns out I find them all useful so I kept them all installed on my browser. They come in handy if you have a tendency of opening too many tabs. Essentially they allow you to store and save the website on each tab for later use. Convenient search toolbar for Amazon.com. Auto-detects country. No configuration needed! Toolbar button to quickly enable and disable bar visibility. Quick links to commonly accessed sections. There are more cool extensions as MyWOT and LastPass. You will find them useful trust me on this. *FLASHBLOCK* is one of THE WORST extensions and should be avoided like the plague. If you open its options page, it stops working. In fact, the extension process dies completely. Its author abandoned it over two years ago. Not only is this irresponsible, but it damages the extension ecosystem. The point is not to have as many extensions as Firefox, but to have GOOD ones that work. It sad that most people don't actually test-drive browser extensions *thoroughly* before recommending them to people and posting misleading reviews.